“After the announcement of your nomination as candidates for the position of the Director-General of the World Health Organization, we have followed with great interest the hearings in early November when you presented your visions and answered questions on your candidacies. We found more information on your public profiles and in your interviews with several journals and organizations. We then asked civil society colleagues: What is missing in the candidates’ statements? What worries you? Where do you like them to be more concrete? 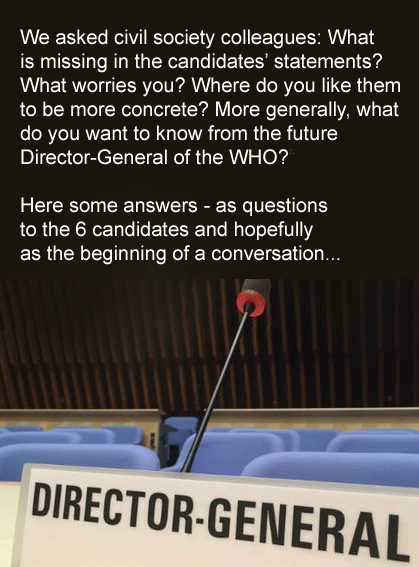 More generally, what do you want to know from the future Director-General of the World Health Organization? We invited our colleagues to offer question that could be concisely answered by you, and we received a great number of them. Find below a selection. We herewith kindly ask you to send us your replies. They will be published on this webpage and announced via the G2H2 Twitter channel and indirectly through our member and partner organizations and networks that collectively represent or reach millions of constituents on every continent. We are encouraged by the transparency of the election process and willingness of DG candidates to engage in a dialogue with WHO member states, civil society and the public at large. Our outreach efforts will support and measure that dedication to openness. Update 24 January 2017: Following the publication of this Open Letter and its promotion via G2H2 Twitter channel, WHO DG candidates remained silent for a good while. In the meantime, we are happy that we received first answers by Flavia Bustreo. Many hanks! Let us see if other candidates will follow. Update 26 January 2017: And now the only DG candidate who responded to the civil society questions (Flavia Bustreo) is not on the list of those nominated for the election at the 70th World Health Assembly in May. The questions are nevertheless still valid, and we hope to get, in due course, into a conversation with the remaining candidates Tedros Adhanom Ghebreyesus, David Nabarro and Sania Nishtar. During the last financing dialogue in November 2016 there was a heated debate on the proposal by WHO’s Director-General Margaret Chan to increase the assessed contributions (ACs) by WHO member states by 10%. This increase has been proposed to fund WHO’s core capacities and ensure its normative work can be sustained, and is part of a longer ongoing reform of the organization. Germany and some other member states support this 10% increase in ACs, but other countries hesitate due to their stated doubts about the efficiency of WHO’s work. What would you, as WHO’s new DG, do to convince the member states of the crucial importance of increasing the core funding of WHO? Given that 120 million people fall below the poverty line each year because of paying for health services, how would you lead member states to adopt public financing for delivering Universal Health Coverage? There is a widely held perception that the Framework of Engagement with non-State Actors (FENSA) uses a lot of verbiage related to conflicts of interest, but actually confers considerable discretion on WHO staff to weaken safeguards against undue influence by multi-billion-dollar corporations that manufacture, sell, or invest in products and services related to WHO’s mandate and guidance, especially, food, alcohol, pharmaceutical, and medical technology products. Skepticism has been fueled by the fact that FENSA negotiations were repeatedly held in camera, with no access, even as observers, to public interest NGOs. While some WHO staff insist that conflict of interest safeguards will be robust or even stronger than before, they have been conspicuously silent on whether such industry associations will be eligible for WHO Official relations, technical collaboration, or as donors. If you are elected Director-General, would you ensure that these industries are kept at arm’s length from the WHO in the same way that tobacco companies and the arms industries current are? In 2008, the Commission on the Social Determinants of Health reported to the WHO DG. The WHO responded by co-organising a World Conference on the Social Determinants of Health with the Brazilian Government. This resulted in the Rio Political Declaration on the Social Determinants of Health (2010). Since then there has been very little follow-up on this Declaration and there is no dedicated staffed division on the social determinants within WHO and few WHO staff have a dedicated role to advance the social determinants agenda. This is despite the evidence that the world is growing less equal and health less equitably distributed and that social determinants are largely responsible for driving these inequities. What actions will you, if elected Director-General, take with regard to the social determinants of health? Will you establish a dedicated division within the organisation to address the social determinants of health? If yes, at what level will you staff this division? To what extent will you work with other United Nations agencies on the social determinants of health and health equity agenda? Persisting deep health inequalities, insufficient accountability, and incoherence between health goals and non-health sectors continue to impede national and global efforts towards securing the right to health for all people. A Framework Convention on Global Health has been proposed by a wide range of civil society organizations and national and global health leaders as one critical component of responding to these challenges. United Nations Secretary-General Ban Ki-moon has encouraged the international community to recognize the value of and consider this proposal. The treaty would foster the national and global governance for health that will better enable all people to realize their right to health. If you are elected to be the next Director General, what might you do to help advance this proposed treaty? What would you, as new WHO DG, do to make sure that the voice of civil society—in a broad sense, including people, patients, communities, workers, and their organizations—will be better heard in the shaping of health policies and health-related standards and regulations at all levels? Readers: Your feedback is welcome! Comments on this conversation are most welcome. Before being able to submit comments on the G2H2 website, please register as a user – and get back to this page afterwards!